I realize these topics have nothing to do with workplace wellness, but I've been involved in two things that I'd like to share. 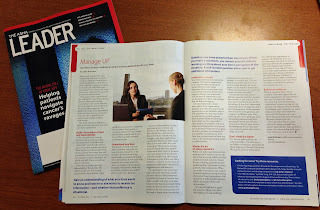 First, in the October issue of the ASHA Leader, there is an article I wrote called Make It Work: Manage UP. It includes six tips to help you cultivate a healthy working relationship with your boss. Almost everything I write appears online, so it is fun for me to see something I wrote in actual print. My son, Ian, helped me think through the content. He graduated from college a year ago and he's working with Walmart as an assistant manager. I love hearing his perspective on management issues, so writing it was fun too. Over the years, I've seen people make a lot of what I call "career limiting moves." Writing this piece gave me a chance to put together those observations with Ian's fresh perspective. Sarah Halzack wrote and article for the Washington Post titled In an uncertain economy, pay raises hover at a modest new normal. She interviewed me when she was working on it and includes a few quotes. We actually assign individualized salary ranges to each job (not each job category), but she captured the gist of what we do well and it's an informative article. Definitely worth reading if you work in the DC area. Hope you'll forgive the diversion. I usually rein in my impulses to write posts that are off topic, but what's the point of blogging if you can't exercise a point of personal privilege now and then.